Start Early: When teeth first start erupting, it’s important to brush and floss for little ones. Talk to them during this process and explain why you’re completing the task at hand to help them learn. 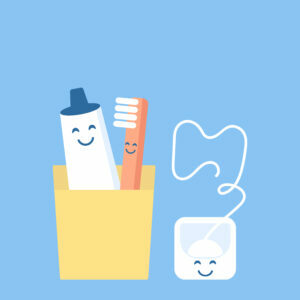 Use Products for Kids: Child-size brushes, better-tasting toothpaste, and other specialty products are specifically designed for the needs of children, including different ingredients and shapes for growing teeth and structures. When kids are old enough, let them pick out their own toothbrush when shopping to help encourage positive feelings about dentistry. Don’t Instill Fear: As children grow up they can become more resistant to brushing and flossing, but try not to lose your temper. Praise good behavior, encourage compliance, and set them up for greater comfort with both at-home dental care and visits to the dentist. For more information about how to help your kids develop excellent oral hygiene habits, contact our practice to speak with our friendly and knowledgeable team.